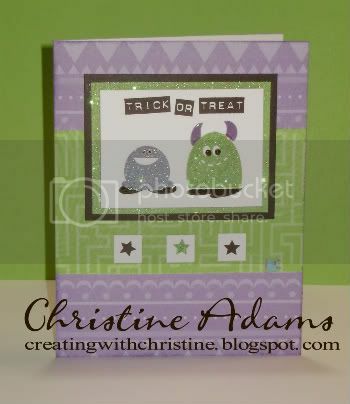 This is the card we are making at Debbie's Open House this Saturday in Van, WV. 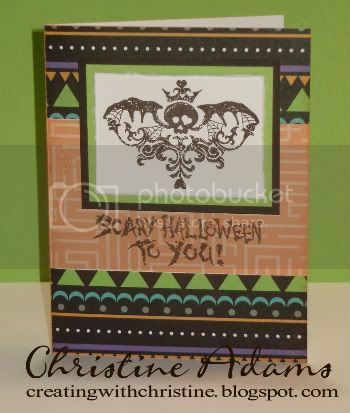 Her friends wanted to do a halloween card, so I chose the Hooligans paper, along with the Hooligans WOTG stamp set - Troublemaker, and our stamp of the month - Thriller. Using an Originals card pattern called Overview, we can make very different options of the same card using the same materials! This card uses the backside of the pac-man looking paper to reveal a lighter shade of our new Sunset color. This would be for an older child. I also edge distressed the white cardstock to rough it up a little. There you have it - two very simple cards, using the same papers and the same pattern with very different results!